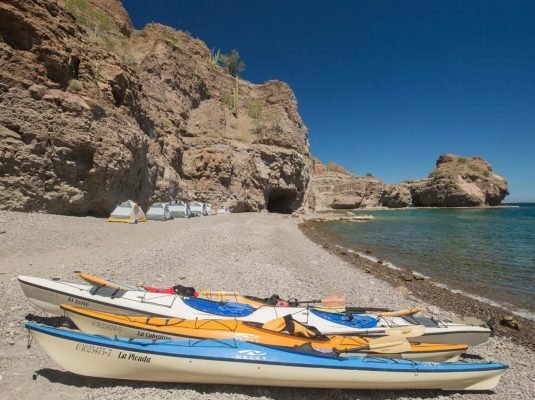 The Sea Kayak route from Mulege to Loreto is one of the more remote routes along the Sea of Cortez. 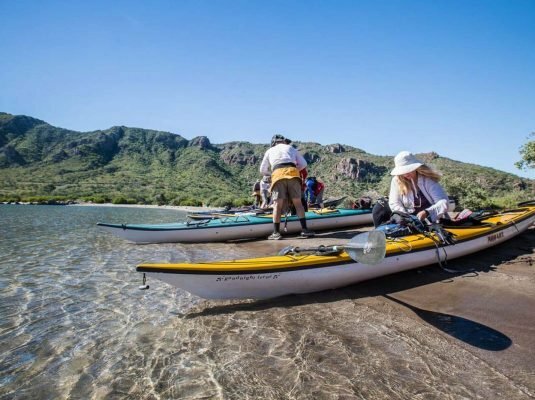 Starting near Mulege, a small oasis town to the north of Loreto, we take our kayaks past Conception Bay and down the eastern coast of the Baja Peninsula. We’ll be spending approximately 4-6 hours per day paddling, so you should consider this trip if you have some previous kayaking experience. If this will be your first time on a sea kayak, consider trying one of our Coasts & Islands or Classic Islands trips first. We meet you as you arrive at the airport in Loreto and get you transport to the hotel. You will want to book a hotel in Loreto. At the orientation meeting, we’ll discuss the plan for the trip and answer any questions you may have. Our trip starts on or near Conception Bay, a large inlet of water south of Mulege. There are several popular coastal campgrounds in the area. 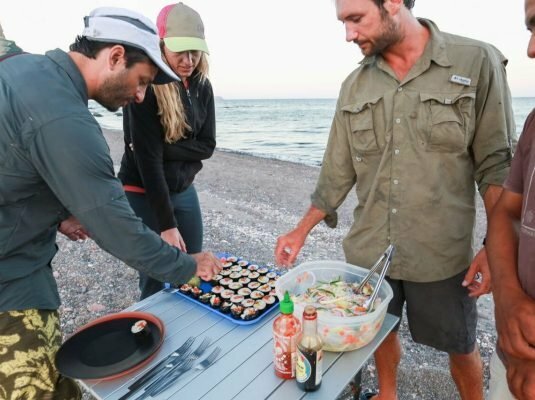 If the weather permits, we’ll cross the water and make our first camp on the more remote and unpopulated eastern edge of the bay. Conception Bay works as a natural buffer against encroaching civilization, keeping us separated from the towns and noise that tend to develop around the federal highways. In fact, the protruding finger of land that forms the eastern coast of the bay is rugged and remote, with plenty of opportunity for exploration. 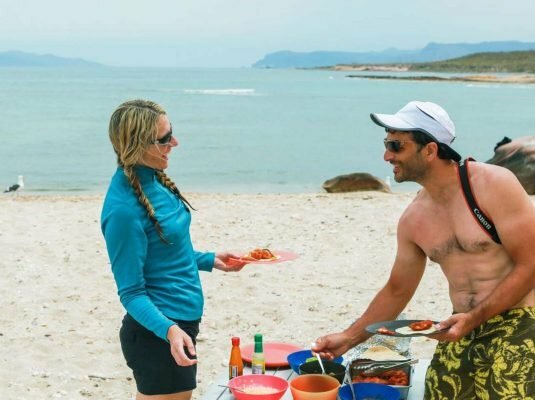 The Sea of Cortez is famous for its rich fishing grounds, and as we continue down the remote eastern coast of Baja California, you will encounter fishing camps that are rarely visited. Fortunately, your guides are locals to the area and can point out many of these locations. 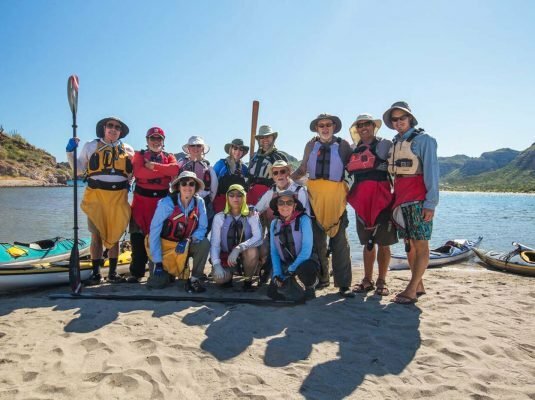 Our guides have been taking kayak trips down the coast for many years, and in that time they have built strong connections with local villages and communities. You may have the opportunity to visit a fishing village and learn about the local way of living. As we head in a more southerly direction following the coastline, you’ll notice impressive ridges rising along the coast. The desert landscape curls into secluded canyons and intimate coves, and your guides can show you the lush oases that hide within these areas. If the conditions and time permit, we like to include a stop at the fishing village of San Nicolas. From here you can hike to nearby Punta Púlpito, and continue for a glimpse of the protected yacht harbor of San Basilio Bay, dotted with small islands that make for picturesque campsites. The rugged and remote territory we’ve been paddling through gradually gives way to expansive beaches, but there are still few signs of people or civilization. 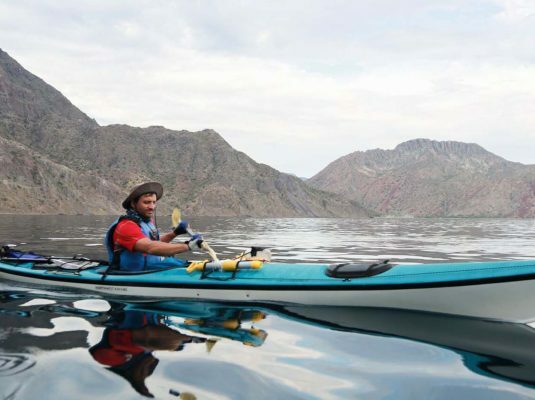 Some of the most isolated kayak trips you can take in Baja are between Mulege and Loreto. Part of the reason for this isolation is the challenge. Along with the bay crossing on Day 1, there are several points in this expedition that may test your skills in a kayak. Fortunately, you are rewarded for your work with access to colorful, beautiful beaches that are perfect for camping. Our last full paddle day takes us on another crossing, to nearby Isla Coronado, where we make our final camp. Created by prehistoric volcanoes, this island is surrounded by beautiful white beaches, and is close enough to Loreto that you can see its lights at night. We paddle for Loreto in the morning, crossing back to the coast and hopefully getting to the take-out before noon. Once the equipment is loaded, it’s back to the hotel for a shower and rest, followed by a farewell dinner that night. You have the day to yourself to explore the cobbled streets of Loreto, or to simply relax by the pool. We can arrange transportation to the airport, and the front desk will help you determine the best time. You bid goodbye to Loreto, richer for the experiences you’ve had and the memories you’ve created. This trip begins at Loreto, then proceeds to Mulege for the put-in. Mulege is a small oasis town in the middle of a desert, with a population of less than 4,000. While many people with the time and patience enjoy driving into Loreto from San Diego via Federal Highway 1, the easiest way is to fly into the nearby airport. Alaska Air/Horizon flies to Loreto from Los Angeles, and AereoCalafia offers direct flights into Loreto from Tijuana. 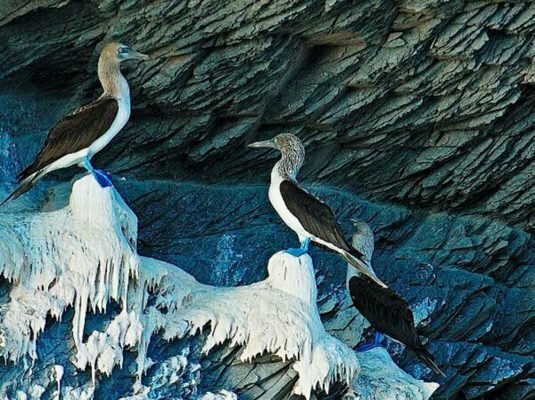 You can also try reaching the town by flying to La Paz or Cabo, and getting a connecting flight or other form of transportation from there. Contact us for more information on traveling to Loreto.